Top Pick: Makita LC 1230 12"
Runner Up: DeWalt D28710 14"
For a professional welder or a hobby metalworker precision makes projects easier. A good metal miter saw will make quick and easy work of any task. Whether you’re making many identical cuts or cutting to specific measurements, miters do it all. Finding the right miter or chop saw for metal work is especially important. There are a few different types, and the wrong one could have disastrous choices. By Gregory Sanders: This article has been updated to reflect the most accurate information regarding metal miter saws available for those who are interested in metal saws. The best 5 available have changed, and information has been added to assist individuals in finding the best metal miter saw currently available on the market. The FAQ has also been updated. Let's have a look at some of the best chop saws and see how they stack up. 1. Makita LC 1230 12"
The Makita LC 1230 12” metal cutting saw is a powerful and efficient tool. It has a 14 amp motor which gives it a faster cutting time on light jobs. It has a number of safety/convenience features including a comfortable D-shaped handle, a tray which collects metal shavings, and it comes with a socket wrench and built-in holder to make changing out blades a breeze. It does have a locking system built in, as well as a spark guard for safety. 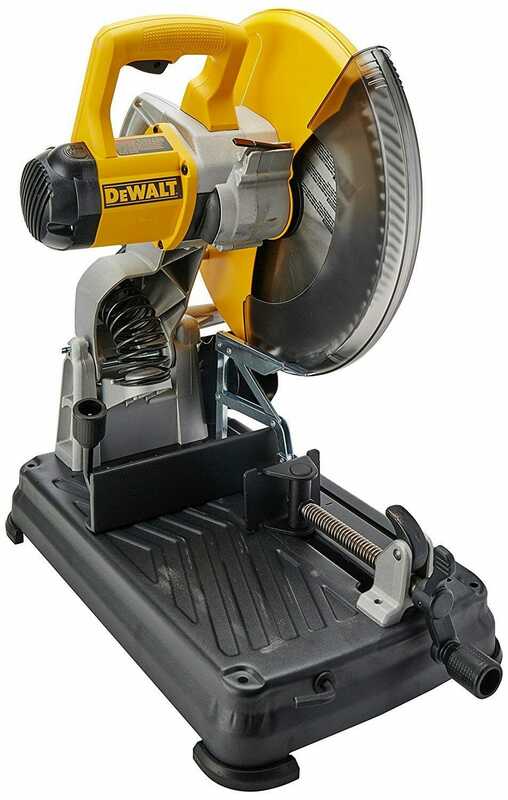 This Dewalt is another powerful tool with a 4 HP, 15 amp motor. It has an easy lock-unlock blade change system for quick blade changes mid-job. There is a spindle lock to make this a portable unit. One of the nice features of this saw is the angle of the handle. Rather than a straight vertical “D” handle, it has a horizontal “D” handle. The handle makes it much more comfortable to use for long periods of time. It also has a fully adjustable spark detector. The C10FCE2 is a really great miter saw with some cool features. It has the usual features like a dust bag, adjustable angles, and a 15 amp motor. But it also takes flexibility and precision to the next level. Not only does it have an angle fence, the C10FCE2 goes to a whopping 52-degree angle, 7 degrees further than the standard 45-degree miter saw. It also has up to 45 degrees of beveling options. For maximum precision, you can also shell out for a laser sight and never miss that crucial cut again. The Porter-Cable chop saw is another 15 amp machine. It has a great spark guard which features markers to keep your wood sighted while it protects the user. The spindle for the blade locks and unlocks for easy changes, and so does the base clamping system. The quick-release material clamp allows for easy material cutting and removal. This makes for quick cuts. It has a 45-degree angle fence for angled cuts. The base is metal rather than plastic so it’s very sturdy and balanced. The DW872 makes a lot of claims, but it lives up to them. It offers very fast cutting and precise lines, leaving behind no burrs. There is a good locking clamp system that doesn’t sacrifice safety or speed. It has a comfortable horizontal D-shaped handle for more comfort during long projects. Another great feature is that it is a cold cut blade, meaning a longer lifetime of your blades. It does have the 45-degree angle fence. However, sometimes it has the tendency to come loose during repeated use so you should check to make sure it’s keeping the angle you set it at. Metal miter saws, or chop saws, are good for making fixed-angle, repetitive cuts. They are often equipped with clamping devices to hold your metal bars in place. All you need to do is guide the cutting blade down. They make quick, repetitive cuts with precision and reduce the amount of time it takes to cut base metals for any welding job. Metal Miter saws also often include the ability to angle cut. Cutting joints for frames or preparing an angled weld is much easier when the joint has a precise angle. As either a pro or a home-hobbyist, you’ll find the precision of a miter saw makes easy work of difficult projects. It is important to make sure you’re looking at a metal miter or chop saw specifically designed to work with metal. Metal miter saws actually work at a slower RPM than standard miter saws and also use a different type of blade. Metal miter saws have many safety features built in, like blade-cooling and shields to redirect sparks and metal burrs in the air. These are features not found in most standard miter saws. While you might get lucky using a regular miter saw with metal, it is NOT worth the chance of throwing a bar across the room and endangering your life. When looking at metal miter saws there are a few main features you want to keep an eye out for. First, make sure your miter saw has some sort of clamping mechanism. This is essential to holding your tubing or metal bar in place when you cut. Another important feature is the spark deflector. This is an adjustable plastic shield which prevents the saw from throwing sparks and metal shards. Not all spark deflectors are created equal, so always check what people have to say. Adjustable angles, also known as an angle fence, are not on every miter or chop saw. Finding one that has an angle fence will allow you to perform a wider range of projects. Blade type makes a big difference. Aluminum oxide, silicon carbide, and zirconia are all materials used for blades and each will be good for different types of metal. Make sure your miter saw can easily switch out blades. Switching makes it easier to work with different types of projects and for when your blades wear out. Try to find out what sort of cooling features a metal miter saw has both for the engine and for the blade. Some rely on cool grinding wheels to reduce the heat created, but some have built-in cooling capabilities as well. Other aspects you may want to consider when choosing your miter saw are how you plan on using it. If you are working at a different site each day, portability features like locking pins are important. If you’re concerned about longevity, also keep an eye out for units which may have “soft starts” that reduce wear and tear on the motor. Whenever you choose to use a miter saw, make sure you are using plenty of proper safety equipment. The safety features don't make gloves and earplugs redundant. They’re there because you’re using a dangerous piece of equipment. When operating a miter saw you should be sure to use eye protection, hearing protection, and gloves. You may even want to consider a respirator or other mask. Airborne metal particles are particularly dangerous and nasty. Remember that there is a big difference between wood miter saws and metal miter saws. Use the proper miter for the proper material. If you do want to “cross over” make sure that you have equipped the right blade. Do a bit of research about the properties of various cutting and grinding blades and the various materials (zirconia, silicon carbide, etc.). Match up the metal you’re working with the right type of blade. And remember not to rely solely on your safety features. Getting the saw with the most safety features is a great choice, but you’re still standing in front of a dangerous machine spinning at thousands of RPM. Respect the equipment and you’ll be in good shape. Miter saws are incredibly versatile and powerful tools in a welder’s workshop. Even the most basic of miter saws will increase your productivity. When it comes time to do the actual welding, you'll be glad you used a precision machine to make the cuts. Picking a miter saw is just a matter of knowing which features you'll need, and what safety features are important. Beyond that take a look at what's available and find the one that's right for you.